Stefano CANAPA (1977, Italy) graduated in 2001 in Film History and Aesthetics from DAMS University in Turin. After moving to France, he combined his training with his experience from the Paris-based lab L'abominable, and contributed to setting up similar kinds of organisations (experimental, artisanal, self-managed) in Turin. Since 1998 he has been part of the French artist collective Group ZUR (Zone Utopiquement Reconstituée). Since 2002 he has been increasingly involved in projects with live components: installations, performance art, multidisciplinary improvisations, and plays for theatre. 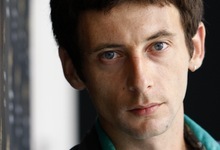 He co-direct, with Catherine LIbert two feature documentary film, "Les Champs Brulants" and "Des Provinces Lointaines". His work has been presented at many international festivals and exhibitions such as Locarno, Rotterdam, Berlin, Oberhausen, Marseille, Paris, Seoul, New York, Toronto, Montreal and Belo Horizonte.